See contemporary designer jewelry in gold and silver with gemstones. 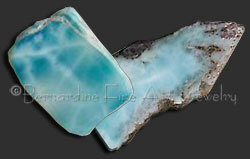 Larimar is a rare form of pectolite, which was discovered in the 1970's and is only found in the Dominican Republic. It has an extraordinary blue appearance similar to the color of the ocean in tropical areas. Hardness varies between 5-7 on the Mohs scale with the darker blue stones ranging closer to 7. This unique Caribbean gemstone sometimes may be mistaken for turquoise. Its powers are believed to helps us view events from different perspectives, to soften and enlighten, to heal the emotional, physical, mental and spiritual body. 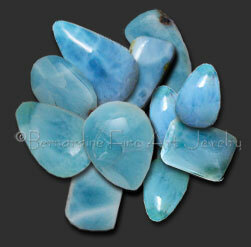 Larimar stimulates the heart, throat, third eye and crown chakras promoting inner wisdom. It represents peace and clarity, healing and love. Larimar is reputed to be helpful for those experiencing stress and anxiety. Larimar ring , other larimar jewelry and a selection of freeform cabochons and rough available for custom jewelry design. Gemstones of the World by Walter Schumann. Sterling Publishing Co., Inc.